With summer in full swing, it’s the perfect time for a summer vacation. But planning a trip, booking airline tickets and hotels, and packing up enough gear for a week or two away from home can be both stressful and expensive. So how can you get that much-needed rest and relaxation on vacation without adding stress beforehand? Answer: try a mini-vacation at Serenity Springs! Our convenient location, just a short drive from Chicago, Ann Arbor, and Indianapolis, means that your relaxing getaway is not far away. It’ll only take one tank of gas to get here! A three-, four-, or five-day stay at Serenity Springs will not only give you time to take relaxing walks, spend an afternoon fishing, or enjoy leisurely bike rides around our property, but also give you ample time to sample the many fun activities and attractions just a short distance from the property. What are you waiting for? Book your one-tank trip to Serenity Springs today. Call us at 219-861-0000 to make your reservation. Whether you’re new to Serenity Springs or a frequent guest, here are just a few new ways you can bring a little Serenity to your life. Moms do so much, and they definitely deserve some pampering! Take your mom to Serenity to share an experience that you both are sure to treasure forever. While you’re here, enjoy massages in your cabin side-by-side, take a relaxing stroll around the property, and cap off the day by making s’mores on your personal fire pit. It’s the perfect way to thank mom for all that she does. You and your friends lead busy lives — whether that involves jobs, kids, classes, or other commitments, it can be tough to find the time to just let loose and have fun together. A trip to Serenity Springs is an opportunity to spend some quality time with your girlfriends, away from all of life’s distractions. Get dinner delivered to your cabin, pop a bottle of bubbly, and watch a romantic comedy (or any of the many other movies we have available for guests at the check-in desk). You’ll both come back feeling rested and ready to take on the world. Disconnecting to reconnect isn’t just for building up your relationships with others — you also need to take time to reconnect with yourself. Visiting Serenity Springs solo is an opportunity to both relax and reflect. Take a bike ride on our trails, enjoy a bubble bath in your jacuzzi tub, and spend some time meditating on your porch overlooking the water. A little time to yourself will help you feel reoriented and rejuvenated. Ready to disconnect to reconnect? 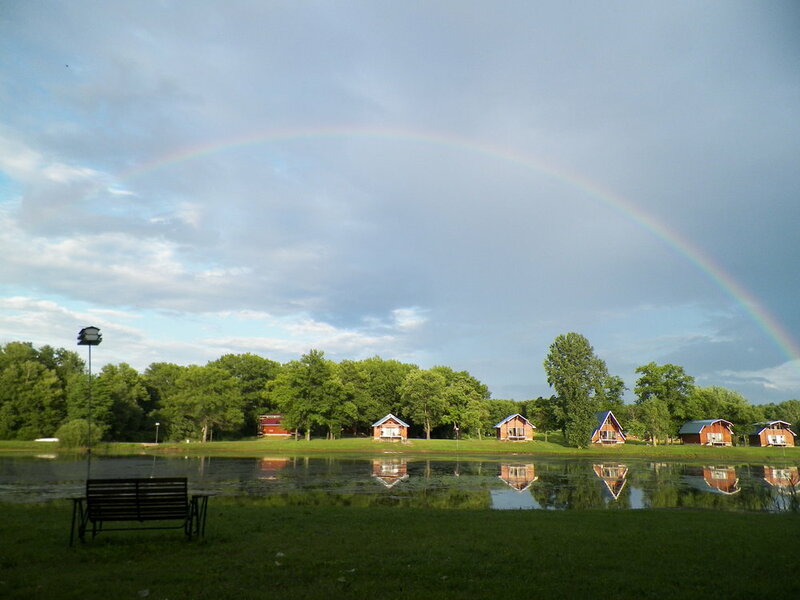 Book your stay at Serenity Springs by calling us at 219-861-0000. Life can be stressful. With jobs, family commitments, and more, it’s easy to get caught up in an endless to-do list — and that to-do list rarely includes taking time to relax in the company of loved ones. Need to release some tension? Try a couples massage for you and your main squeeze. The massage therapists we work with are highly experienced and professional, and will come right to your cabin! Book when you book your stay. While we won’t stop you from using your phone or laptop, we often highly recommend that guests consider turning their devices off at least for some extended periods during your stay. Disconnecting from your devices can really benefit your mental health, by making it possible for you to get away from many of the things that add to your stress. Coloring books aren’t just for kids anymore — grown-ups can benefit from a doodling session too. Here, you can color your cares away with an adult coloring book — we have a variety available for guests to use. Just ask at the reception desk! Each of our cabins has a built-in whirlpool tub (some are even heart-shaped!). If you want to kick your bath experience up a notch, you can request bubble bath — we’ll drop everything you need in the butler door. There’s nothing like snuggling on the couch and watching a good movie to help you unwind. Come borrow one of our DVDs from the reception desk — we have a wide selection of great films! Of course, we can’t forget the beautiful grounds at Serenity Springs. There’s something truly calming about being in nature. Take a stroll around the lake or channel, or check out our trails through the woods. Sometimes, you just need a little peace and quiet out on the water. Spend a relaxing afternoon doing some catch-and-release fishing — we’ve got all the fishing equipment you’ll need. Enjoy a pleasant bike ride around the property to clear your mind. We have bicycles available for guests to borrow, so you can get rolling! While it can be tough to remember to take time for yourself or spend quality time with your partner, it is essential. Over the years, we’ve worked hard to create an experience that allows guests to do exactly that. Come see for yourself how rejuvenating a Serenity Springs experience can be. Ready to book your stress-free stay? Just give us a call at 219-861-0000. Experience a romantic ride in a horse-drawn sleigh. Around the channel and through the woods, to Serenity Springs we go! Enjoy a festive sleigh ride through our picturesque grounds, courtesy of our trusty horse, Izzy. Treat your feet to heated floors. Baby, it’s cold outside… but it’s nice and warm inside our cabins! All cabins come equipped with heated floors to keep your toes toasty, all winter long! Take a hot bubble bath in our built-in tubs. Each cabin has a whirlpool tub (rectangular or heart-shaped) set into the floor. Request some bubble bath through your butler door for an ultra-relaxing bathtime experience! Walk through our winter wonderland. Enjoy beautiful walks around the property. You may even want to build a snowman! Snowshoe (or ski!) through the snow. We provide snowshoes — just ask us! If cross-country skiing is more your speed, feel free to bring your skis along. Feed our feathered friends a snack. One of the most popular times for our guests to feed the geese and swans is the winter. You’ll see them come out. After a day of outdoor fun, snuggle up on a loveseat in front of your fireplace. While you’re at it, maybe open a bottle of wine and play some music through the cabin’s speakers! It may be nearly winter, but the fun at Serenity Springs is just heating up! Book your snowy stay at Serenity Springs today. Here at Serenity Springs, we’re proud to have a tight-knit team keeping the place running. A couple of our employees have been with us for 10+ years. Our first of two spotlights focuses on Elizabeth M., a long-time employee at Serenity Springs. You may know her from speaking to her over the phone, greeting her at the office, or receiving her assistance at your cabin. Below, check out some of Elizabeth’s most memorable moments and why she’s made Serenity Springs her home away from home. 1. How long have you worked at Serenity Springs? My first day was July 6, 2006, I think. Definitely July 2006. 2. Over a decade is a long time. What’s made you stick around? I’d say the family atmosphere. We’re not blood-related, but it feels like a family atmosphere. It's rare to find that in other places of work. There’s just a handful of us here so we have become really close. 3. Can you tell me what your first job was when you came to Serenity Springs? I started here as a housekeeper. I actually didn’t mean to apply here — I wasn’t looking for a job at the time. I was just being nosy while coming home from a friend’s house on July 4th weekend, and I saw this road and thought, “What’s down that road?” I’d grown up nearby — actually on the land behind Serenity Springs, though that was before Rich and Laura bought the property — but I didn’t remember having seen that road before. So I went down the road and saw it was a business. I drove up and was like, “What am I doing here?” Because it wasn’t a convenience store or anything. Then I actually walked in, and the first thing that I thought to say was, “Do you have an application?” And then once I finished the application, I turned it in, and I started working there the next day. I’ve always kind of thought it was fate. 4. What are some of your current day-to-day tasks? We’re all cross-trained in all aspects, so we each can do a lot of different tasks. I generally work on the reservations desk, handle guest relations, and do some light maintenance, especially on weekends. If a tub handle comes loose, I’ll come fix it. I do a little bit of everything. Today, for instance, I participated in a meeting with Dish Network to get some ideas about upgrading our network of TVs here. There are some tasks that my co-worker Connie and I exclusively handle, because we have a general knowledge base of Serenity, since we have grown with the business for so many years. I tend to handle a lot of the communication, like the emails, Facebook private messages, things like that. 5. What do you enjoy most about working at Serenity Springs? I’m the type of person who enjoys working in an ever-changing environment. And time-wise, whether I’m working a five- or 14-hour day, it’s different every minute here. That means I don’t have a set office — I’ll be sitting at the reservations desk, then standing by the lake, rescuing an injured bird. I get to do so many fun things! I also love the feeling of seeing a guest come in exhausted from general adult responsibilities one day, then leave rested, relaxed, and restored, after a night or two here. We cater to couples needing to reconnect with one another and to individuals who just need a little serenity in their life. We have also noticed an increase in mother/daughter getaways and "girlfriends" retreats. Everyone deserves a little serenity. 6. Why do you think what Serenity does is important? We’re in the business of encouraging connections and relaxation in a romantic atmosphere. People don’t realize how stressed they are from work or that it’s okay to take a break from the kids. But when people check out, they can’t believe how relaxed they are. I think more people need to hear, “You don’t need to feel bad. You can take a break from work and the kids.” People need to get away — they need that break on the weekends. It gives you a chance to clear your mind, to freshen up. 7. Which cabin is your favorite? I actually have three favorites. My absolute favorite is Cabin 17, the Twilight Cabin. It’s the first one I ever stayed in. It has a channel view, plus there’s romantic lighting from the beams, and I just like the whole color scheme. I also love Cabin 36, the Ski Lodge. It’s really private, and Laura did an amazing job with the decor. And my newest favorite is Cabin 12, the Congo. It’s a premium cabin located on the channel near the clubhouse. I really like the interior décor and secluded feel of this cabin’s location. 8. Fondest memory while working here? I have two favorite guest stories...Karen and Chuck Huff have been coming to Serenity since we first opened. I’m comfortable even saying they were probably two of the first 100 guests to have stayed with us. Through the years we have become really close. They are more than just "guests” now — they are family to the rest of the staff and me. Karen enjoys bringing us treats and goodies from a local bakery in Lafayette, Indiana (where they’re from), and we enjoy eating them. During their most recent visit, I was having car trouble, and Chuck and Karen insisted I drive their truck home so that I could get back to work safely. I appreciated the generous offer and almost took them up on it. Thankfully, I was able to quickly "band aid" the problem and get my car fixed properly the following Monday. Noel (AKA Captain Butterfly-Noel) and Alyssa Meyer have also become close friends of mine and Serenity’s. They drive approximately six hours to visit us from Ohio. Noel started visiting us years ago because he enjoyed fishing. He would come alone and fish from sun up and sundown. We gave him the name “Captain Butterfly” because he was staying in the butterfly cabin and is an Ohio police officer. While at home in Ohio, he met his now wife Alyssa. There was no other place he would think to bring her. They were in love with each other and Serenity Springs. So much so, they planned to have a small "elopement" wedding here (we have a vow renewal/elopement package available). I was personally invited to their small wedding, and wouldn't have missed it for the world (I came in on my day off to participate). I have two other favorite memories of working here, not counting the guest stories. The first one is that my boyfriend and I met here, near the time that I began working at Serenity. He has known the Ostergren family for several years, was a part-time employee here, and was actually fishing on the property the first time I saw him. I’ll never forget that day. We’ve been together 11 years, so we definitely benefit from some Serenity once in awhile. My other favorite memory relates to more recently — I lost my dad a few weeks ago. He was sick almost all of 2017. The Serenity staff, Laura, and Rich supported me in a way I never expected them to. I took 18 days with no notice, and it was fine with them. They took care of things and filled in for all my shifts. Rich and Laura brought pizza to hospice so we’d have something to eat, only hours before my daddy passed. The majority of the staff showed up at funeral. I needed them at that time, and they were there. I’ll forever be grateful for having such a wonderful work family and friends. It’s no secret that the world we live in has become a digital-focused one. We depend on our devices for news, updates, and guidance. At Serenity, we’re proud to offer our guests a place for guests to relax and unplug, but we know that mobile apps can be a helpful resource on your trip, whether you plan to spend time in our haven of relaxation or decide to explore the area. With that in mind, we’ve put together a list of apps that can make your stay at Serenity even more relaxing. Did you know Uber is available in LaPorte and Michigan City? Uber can take our guests to many places in the the surrounding area — all at a relatively low cost! If you’re traveling from Chicago, you can use Uber to travel to and from our closest train station on the South Shore Line, Carroll Ave. Station, with ease. Feel free to leave your car at home! New to Northwest Indiana, Lake Life is an app that provides users with a list of restaurants, shops, coffee shops, and more, for each of the many popular areas along the coast of Lake Michigan. If your mobile device is an Apple product, click here to learn more about Lake Life. If your device is an Android product, click here. If you’re having a hard time deciding what’s for dinner, Yelp is a great resource that allows you to filter types of cuisine, city, price point, etc. Whether you’re planning to go out or stay in your cabin for a candlelit dinner arranged by Serenity Springs and an area restaurant, Yelp can help you find the perfect restaurant. Planning for rain, snow, or any inclement weather is tough, especially when the forecast changes quickly. Try the Weather Channel apps to get updates on weather conditions — some of the features they offer include interactive radar, rain alerts, and storm tracking. And even if unexpected weather causes you to have a change of plans, we have plenty of movies you can borrow! This navigation tool gives you the fastest route to your destination, allowing you to spend less time driving and more time hiking, fishing, or watching movies. Waze helps drivers let each other know about traffic issues, driving conditions, and more. You can use Waze to help get you to and from Serenity, plus help you navigate to the many nearby attractions along Lake Michigan. iExit allows its users to find pitstops along their journeys. This is perfect for Serenity guests who have to travel a few hours to us and back to their homes. This is just a short list of the apps that can help enhance your stay at Serenity — no doubt there are many more! We hope that these help you unwind, have fun, and make your stay incredible. And don’t forget, if you have any questions or need any recommendations, our staff is always ready to help make your stay as enjoyable as possible! To book your stay, call us at 219-861-0000. For nearly 20 years, we’ve made Serenity Springs a place for people to get away from the stress of daily life. Here, away from the traffic jams, daily tasks, and deadlines, people can really unwind. One major source of stress that can be especially hard to get away from? Our electronic devices. Over time, phones have gotten smaller and more portable, which means it’s getting harder to truly disconnect from the outside world. More importantly, we may not even realize that we need peace and quiet, because we feel dependent on our devices. Meanwhile, the stress of reminders and important messages adds up, negatively impacting our ability to function. That’s why it’s key to set aside time to unplug from our devices and take a break from our normal routines. Setting aside our devices allows us, along with our devices, to recharge. Below are some of the top benefits of unplugging. You might think, “oh, I keep my phone on silent when I go to bed, so it doesn’t affect my sleep.” However, it’s not just the noises of phones and other devices that can disturb your sleep. For one thing, having your devices in your bedroom can make it harder to let go of the day’s events and drift off to dreamland. As the National Sleep Foundation points out, you need time to get away from all the stressful things in your inbox. The National Sleep Foundation also points out that looking at the glowing screen of a TV, tablet, computer, or phone within 30 minutes of bedtime can make it more difficult to fall and stay asleep. Try to avoid using devices within 30 minutes of sleeping. If you can, leave your phone in another room, and go the old-fashioned route when looking for an alarm clock. We love social media just as much as anyone, but it can be a source of stress. When you have easy access to glossy photos of glamorous people, lavish homes, and other seemingly perfect scenes, it’s possible to become dissatisfied with your life in comparison. Checking your social media feeds less often may help reduce the pressure to compare your life to others’, Fitness magazine suggests. Without the constant presence of images to compare yourself to, you’ll be better able to appreciate the things that are great in your own life. Having a work-life balance is critical for all employees. Yet, as smartphone technology makes it easier to stay connected to work wherever you are, employers increasingly expect employees to check their email on nights and weekends, causing the boundary between work and home to become blurred. According to research from Colorado State University, thinking about the emails that you’ll have to send after you leave the office can increase your stress levels, and ultimately cause you to feel emotionally exhausted. Understandably, emotional exhaustion has a negative impact on both your work and home life. By setting your devices aside when you come home from work, you could reduce the likelihood of emotional exhaustion. Taking that time to recharge can help you be more prepared and optimistic about facing the next day at work. If you’re concerned that you might miss something by not checking your email during the evening, you may want to try implementing some of these strategies to alter your work patterns in such a way that ensures that you still get time to relax. Yes, our electronic devices have given us the ability to communicate more easily with people around the world. But they can make it more difficult to effectively communicate with people across the room. Not only can checking your smartphone take away time that you could be spending with loved ones, but it also can affect the quality of your relationship. Research has shown that both partners and children can feel the effects of a person’s frequent phone checking. According to a study from the journal Psychology of Popular Media Culture, members of college couples who felt like their partners were too dependent on their phones felt less satisfied with the relationship. Other research suggests that many kids feel that their parents check their phones too often and/or that their parents’ phone habit makes them feel unimportant. That’s why we like to remind our guests to “disconnect to reconnect.” It can be difficult to break the habit of checking your phone or computer, but it’s important to give it a shot. If you can, try to check your device only at certain times. Even better, try to keep your devices out of sight. That way you can focus on your loved ones without interruptions. Ultimately, we know it’s impractical (and probably impossible) to unplug from electronic devices completely, but it’s still worthwhile to try unplugging when you can. It’s a great way to achieve a little bit of serenity. Summer has always been, and continues to be, one of our busiest seasons at Serenity. With so many exciting things to do, and yet plenty of time to relax, it’s no wonder guests love to book a “Serenity summer” stay. We decided to ask our Facebook fans what they enjoy most about Serenity during the summer. Getting our guests’ feedback is very important to us, because it provides us with perspective and helps us determine what we can do to make Serenity Springs even better. When we asked our question, we noticed that there were some trends in the responses from our fans. All cabins come equipped with your own personal fire pit — perfect for making s’mores! We provide the ingredients free of charge. We offer shoreline catch-and-release fishing on the property. It’s one of our most popular outdoor activities! Enjoy our walking trails and onsite bicycles, free to borrow. Our pond is home to many geese and ducks. We’ll provide some corn so you can give them a snack! We ask for guests to unplug when they stay with us, so no interruptions stand in the way of reconnecting with loved ones. Plus, being away from your phone is a great way to de-stress. Light switches indicate when service has been delivered to each cabin. This can include deliveries of food, random requests fulfilled, and fun surprises! **Please note that massage therapy is not available anytime and it is best that we have an advanced notice since the therapists are independent and are not on site except for scheduled massages. What are you waiting for? 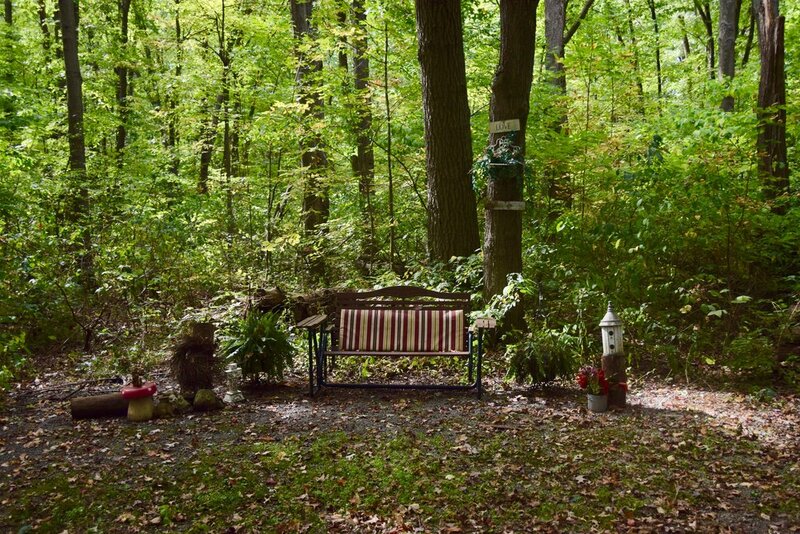 Come find your own serenity by calling 219-861-0000. In Part I of my conversation with Laura, we talked about the vision and founding of Serenity Springs, and its identity as a family business. In this section, we talk more about the work it has taken to keep the business going for 20 years. Katie: So, what are some of the biggest challenges of owning and running a business? Laura: Well, let’s see... I think finding good help is probably the most challenging. And I do have good help — but it’s taken a long time, and especially for what I’m looking for: people who will really enjoy and take pride in their work. We are like our own little family. If I need to bring in someone new, as a part-time person or just as an extra hand, it’s hard to find somebody who really fits the shoes. Everybody that we have right now — they’re family, and we care about quality. Here, you don’t cut corners. If you’re gonna do it, you gotta do it the right way. And take pride in what you do. You can’t bring a person to their cabin, find out that the fireplace switch isn’t working, and say, “oh well, it’s August — you don’t need the fireplace switch anyway.” No. Everything works no matter what. And if that means that you’ve gotta take that extra little time to fix something or have it fixed, you do it. We don’t like people who brush things off or make excuses. So, I would say our biggest challenge has always been finding good help, and finding the right help — people that fit. It takes a special person to fit — to enjoy and be comfortable with all that the job requires. K: How can you usually tell if someone’s gonna be a good fit? L: Well, usually someone who’s a little older...someone that has enough life experience to know how they would want to be treated, if they were the guest. We do a lot of multitasking. A lot of times, we’re working on plan A, but things happen, so we have to jump to plan B… so it’s important for people to have a flexible mentality. To understand that the procedure today when we have five guests may not be the same procedure when we have guests in all 36 cabins. K: Yeah, it must be hard to disconnect or unwind from that. It’s a 24/7 job for us. In a sense, we never get away from it. When we do try to take a vacation, it’s still a lot of prep work to make sure everyone has what they need, to try to put somebody in charge who can handle things. To me, I’m constantly worried about things if I’m not there. K: Now that we’ve discussed some of the challenges, let’s talk about some of the more enjoyable aspects. What’s been your favorite thing about running Serenity Springs? L: My favorite thing is the guests. When they walk into a cabin, they kind of...they get the wow factor. And when I hear from them that it’s more than what they expected, that the photos don’t do it justice, and “I’m telling my friends about this place,” the positive feedback reassures me that we’re doing something right, we’re on the right track, we’ve got the right product, and we’re presenting it well. I know what we have is something special. I don’t think we would have stayed in business for 19 years, otherwise. In Business 101, they’ll tell you: if you’re gonna start a new business, and you can make it through seven years, your chances of making it are pretty darn good. And when we opened in 1999, it was, you know, a slow start, and then we had the real estate drop, the recession itself, and then we had 9/11 — all of that was within a couple years. But we were able to sustain, hang on, and pull through, though it was very difficult through those years. And now we’re on a springboard going up again. K: During those times, were there just fewer guests than normal? L: Yes. During those times, people didn’t have the expendable income. This wasn’t a priority. They had to worry about the bills that they had to pay. It was hard. With 9/11, the whole nation was shaken by what happened, and most people were afraid to travel by plane. We actually started seeing more guests, people wanted to be with the people they loved, but were looking for someplace a little closer to home. People started being open to the idea of 1-tank trips, and thinking a little differently about staying near home. K: This kind of gets into our next question a little bit: how have changes in the world and in technology affected the way that you run Serenity Springs? L: I would just say as major things have happened, whether it be when gas prices have gone up or events have occurred that remind people to spend time with their loved ones, we’ve been able to remind people to think about the situation positively. Instead of doing that one-day, two-day drive trip somewhere, come to us in three hours and save money on gas. We just try to present ourselves differently, based on what’s going on. As far as technology, we would be nowhere without the internet, as I think would most businesses nowadays. The internet is the main tool of marketing and advertising. Word-of-mouth is always the best, but then even if someone hears about us from a friend, their next step is to go to the website to find out more information. K: Can you share any of the key tactics that you think have helped you adapt the business for continued success? L: I think I would say that having unique features, such as the horse and carriage and the butler door, has set us apart from most other locations. Service, too — we’re just very service-oriented, trying to pamper people, and avoiding a sort of “drive up, sleep, then drive out” experience, which you find at other places. What we’re trying to instill is the whole service, and we’re trying to create a relationship with you, so you feel you are a guest in our home. We try to make you feel very welcome so that you feel like more of a guest… you’re not here to just spend the night and then leave. So, it’s kind of back to basics. We’re working to create a relationship with each guest, and to make their stay very memorable. Who talks about “oh, we spent the night at the Holiday Inn”? What’s there to talk about? Whereas with us, we’re trying to create a whole experience. K: What’s the most important lesson you’ve learned in your 20 years of owning a business? L: Wow. Hmmm, lesson? I guess...if you have a dream, you don’t know if you can succeed unless you try. And I would say that when we first started the whole concept, most people said “you’re crazy — how are you gonna do this? Even if you had the money to build the place, how would you have the money to maintain it?” and “how are you going to get people to come, in order to make money to keep it going?” It took blood, sweat, and tears — it took the hard work and vision that Rich has always had. We just work hard, and it’s been successful. We just have a lot of pride in what we’ve been able to develop and sustain. K: Is there any one business decision that stands out as having made the biggest impact? One example of a big decision might be, potentially, the choice to build more cabins — going from five to 11, 11 to 18, 18 to 36…. L: Well, at the very get-go, all 36 foundations were dug. We kind of knew what the finished project would be, though we didn’t complete them all at once — we did it in stages. We got the first five up and running, and we saw how that worked, and then we thought, “okay, it’s going fairly well — let’s complete the next section.” So the foundations were already dug and done — they just had to build the frame and interior. Rich always had a vision of the completed development. As far as other business decisions, I guess there were a bunch of small ones, based on the comments people have made. We have all the comment cards since Day 1. We’ve kept them all. And we’ve always taken people’s suggestions into consideration through the years.We opened the first five cabins with the amenities we thought people would want, and it probably was two or three years into it when we started noticing that some people would write down “it would be nice if there were a grill.” So we said, “well, I guess if they want to make their own food… here we were thinking they’d rather order and have the food brought in, but there are a lot of people that enjoy grilling. That’s relaxing for them.” So it was because of those people’s input that we put a grill on every cabin. There were a few other things we did just as a result of people’s comments. Simple things, like, “it’d be nice to have a broom in the cabin.” Well, it had never occurred to me that people would want to sweep their own cabins. So now there’s a broom in every cabin. Some of the comments over the years have been silly, but some of them not. But it’s important to read them all, listen to their comments and suggestions, and act on them! K: Do you have any very memorable comments? A favorite comment, or something? L: Oh, there’s countless ones — countless. Not that I could pick a particular one, but I mean through the years, we’ve had...oh, marriages rekindled because of their stay with us, we’ve had mother-daughter getaways after mom had just finished her last round of chemo, and this trip gave her some much-needed time to relax. I mean, there are a lot of memorable comments, but I can’t say that there’s one or two that I can remember verbatim. K: Do you feel like there are a lot of guests that you’ve built up a long relationship with? People that you now know a lot about because they’ve come a lot? L: Yes, I mean we have quite a number of what we call VIGs, because we know when they come that they’re big coffee drinkers, so we give them extra coffee, or that they like bubble bath versus the bath salts. For one gentleman, I always make sure that there is cottage cheese and Reese’s peanut butter cups in the cabin for him when he arrives. I guess that’s just part of me naturally that I like to have that attention to detail and make people feel that I’m noticing them — it’s not just that flat across the board everybody gets the same thing. We had one of our VIGs — this was five or six years ago, or it may have even been longer — they had a trip planned to Hawaii, and it was maybe their 30th wedding anniversary. Well, they ended up having to cancel the trip because her mother was ailing with Alzheimer’s, and just not doing well at all. But they called to reserve a three-day stay with us, and they [the couple] had come several times, so we knew who they were. Because of this story, we decided to put them in the cabin called “Paradise,” because that was the most tropical, and on the second night of their stay, I arranged for us to give them a surprise luau in our clubhouse. I gave them a note in their butler door that said, “be ready at 6:00 — we’re going to pick you up.” So we brought them over to the clubhouse, where we had a full spread, Hawaiian music, real leis, and one of those cutouts that you stick your head into with the guy and the girl. And we just had a real nice evening with them, with pulled pork sandwiches and cornbread, and tropical stuff, because I felt horrible that they had to give up their trip to Hawaii. I really wanted to show them how much I appreciated them coming to us, and that I understood what they had had to give up. They thoroughly enjoyed and appreciated it. And, if anything, that just made our connection with them even stronger. K: That’s a great story! Is there anything else that you’d like to share about your experience? L: In a nutshell, I would just say I’m very proud of what we’ve developed, and that we’ve been able to stay in business. When I go to different shows or various meetings or whatnot — because I’ll do a bridal show or home show occasionally — when I’m just introducing myself, or people are walking by my table, I’ll hear, “oh, my girlfriend has stayed there!” or “oh, I’ve heard of that place.” It’s always reassuring to know that people know of us, and they’ve always heard good things. Curious about what Laura and her family have worked so hard to maintain, and what guests continue to give regular 5-star ratings to on all the main review channels? Call Serenity Springs today and book your stay! Laura and Rich Ostergren have run Serenity Springs for 20 years now, receiving only shining reviews from everyone who stays there. I sat down with Laura to talk about the story of Serenity Springs, and what it takes to run such a successful company. Katie: How did you first decide to start Serenity Springs? Laura: It was kind of a vision of Rich’s. We became aware of the idea or the need for an adult getaway — something more special than a hotel, something that was just a little different — so Rich said, “hey, wouldn’t it be neat to have something like that, but have it on a piece of property, so you actually could take a walk or look at a lake?” You know what I mean? Something with more to it. K: Yeah. How did you choose the location for Serenity Springs? L: We’d had our eye on a piece of property, and then suddenly it just happened to be for sale. We looked into it, purchased the property, and it probably took Rich seven years to build. We built everything ourselves. We built the three warehouses so that we would have a place for storage of equipment and materials. Once the warehouses were done, we built the barn and what we call “the carriage house,” which is the office. Then we built the first five cabins. We opened in 1999 with just the first five cabins, then we slowly worked on the other units, and as we felt we were ready to expand, we grew a section at the time, more or less. We went from five units to 11, and then we went from 11 to 18, and then — I’d have to look at the calendar to check the year — we took a big jump and went from 18 to all 36. K: Wow. And this is just Rich building all of this? L: Well, him with a crew of guys. He wasn’t alone alone — throughout the years, we’ve had different guys working for us. But Rich did all the layout of the property, including the roads, cut down trees, put in the sewer, and made sure all the electric cables were buried, so there was a lot of preliminary work in those first seven years before we opened. K: Sounds like it! So you bought the property in 1992? L: Yeah, it was approximately 1991-1992 when we purchased the property. K: When you first bought Serenity Springs, were you already living in Michigan City? Or were you still living in Chicago? L: At first, we actually had a house both in Oak Lawn, Illinois, and in LaPorte. We’d work during the week and would come out to LaPorte on weekends. Then it got to a point where we were going to have to choose between the two because, at that time, our daughter was five years old and was going to have to go to school, so we had to decide which place we were going to call home. So we chose the house in LaPorte. K: And I know you were working as a nurse at one point. Were you working as a nurse while Rich was building up the Serenity Springs property? L: No, I only worked as a nurse for, I would say, three years after I graduated, because Rich was always kind of an entrepreneur, self-employed, and I basically was his girl Friday. And then when we started the project at Serenity, we still owned a real estate office in Illinois. He did both for a number of years. He’d work early in the morning — he’d start at 5:30 or 6 in the morning — working at Serenity, and then two or three days of the week, he’d stop working at noon, take a shower, drive into Illinois, and do what he had to do there. I mean, I look at pictures, and I think about what we did, and I have no idea how we did it. I really don’t. I mean, it’s like they say: adrenaline, and when you’re on a mission, you can do some impossible things… but still, I really don’t know how we did it. K: Yeah. Wow. That’s remarkable. When did you hire your first employee? L: Well, when we first opened with the five cabins, it was kind of on a whim. It was Labor Day weekend of 1999, and we just thought, “hey, you know, it’s the holiday weekend. Let’s just go for it and see what happens.” So we basically turned the phone on and got the place up and running. I had one girl in the office who took reservations. I would do what we call porter — I would meet you at your cabin, explain everything in the cabin, and get you situated. And then I had one housekeeper. For quite a while, it was just the three of us. And, you know, as we got busier and took more reservations and that type of thing, I was able to hire more people along the way. But I would say, for probably the first three or four years, I greeted and brought people to their cabins myself. At the beginning, we didn’t have six guests every night. I mean, there might just be one on Monday, two on Tuesday, you know — so it was something that the three of us could handle. But Rich put the website on the berm — I don’t know if you’ve seen that picture or not. Do you know what I’m referring to? L: The white letters that say www.serenity-springs.com on the grass berm facing the highway. He put that in probably in 2000 or 2001, and that helped a whole lot with just the interstate traffic — people seeing it, investigating, asking, “what is that place?”, and looking at the website. That was our first main way of advertising, I’d say. Then we also worked at that time with the local visitor bureau, and we were in more paper advertising. We did ads in the Chicago Tribune, the Sun-Times — small ads for weekend getaways, and that kind of stuff. K: So far, we’ve mostly talked about what you and Rich were doing in those first couple years. As a family business, how have your kids been involved in Serenity Springs? L: We say we’re a family business...we are and we’re not, you know what I mean? My kids grew up with it their whole lives. Do all of them have a hands-on, day-to-day responsibility with it? No. Because...because they’ve had enough of it, I guess! L: You know what I mean? It’s just hard. I’ve always described Serenity as my fourth child. The difference between Serenity and my other three children is just that, as long as we have this business, I’m always going to have that 24/7 responsibility for Serenity. She’s never going to grow up, and she’s never going to go off on her own. L: Rich and I are there day to day, either overseeing or working hands-on. Now we’re able to have more of a staff. The kids just help when needed — they all have their own lives and careers. K: Yeah, that makes sense. So they were never responsible for running around, feeding the chickens or anything? L: Well, growing up, all of them spent their summers during high school working at Serenity. My sons did property maintenance — landscaping, mowing the grass, weed whipping, picking up rocks and trash, etc. All three kids have had lessons in driving the horse and carriage, and during those summers they put in their time driving the carriage. My daughter, Ashlie, would run errands and get supplies. Sometimes it would be a part from Lowe’s, if Rich was in the middle of a project and needed something, but the joke in our family is that we always needed bananas. Because bananas only last a few days, we always had to buy them last-minute, so we’d always say, “Ashlie, can you run to the store and grab 22 bananas?” These days, “who’s getting bananas?” is still a big question. K: What are their roles at Serenity Springs like now? L: Nowadays, Miles, my middle son, will drive the carriage when Rich isn’t available — kind of on call to do that as needed. Trace does some of the technical stuff — with the Internet — or writes things if we need something written. When we need their help, they’re there. But it’s not like they’re on the payroll. We’ve always tried to show the kids that if they have a dream, they should go for it, so Rich and I have never wanted them to feel like they have to sacrifice their ambitions and work at Serenity instead. They’re doing their own thing and following their dreams — they’re not falling back on Serenity for a job. Stay tuned for part two of our conversation, in which Laura reflects on what it takes to sustain a family-owned business for over 20 years. If you’re someone with a significant other, you probably celebrated a certain holiday last month (hint: it starts with a “V” and ends with “alentine’s Day”). With all the cards, chocolates, and store displays in pinks and reds that take over every local Target, Walmart, or department store each February, it’s easy to see how we all get too focused on making that one day of the year extra special -- and we end up lost in all the different options. Maybe the stress of that experience prevented you from truly enjoying a perfect Valentine’s Day. However, creating a romantic evening with your loved one shouldn’t have to be stressful. In fact, at Serenity Springs, we’ve gotten pretty good at making sure that it’s downright relaxing (if we do say so ourselves). If you didn’t get a chance to share an unforgettable Valentine’s Day experience with your partner, we have some suggestions for how to create a romantic evening on any day of the year. Check out some of our ideas below. Picking some good music is one of the easiest ways to create a romantic atmosphere. If you already know your loved one’s favorite songs, you can start by creating a playlist with some of those, then incorporate some new ones. If you don’t know your sweetheart’s top tunes, following their Spotify account (or their account on another music streaming service) is probably a good start. For new and fun song ideas, check to see if your music listening platform of choice offers any playlists for Valentine’s Day or romantic evenings in general. Otherwise, you can find good playlist ideas here, here, or here. Another great (and classic) way to set the scene is lighting candles. Just make sure to be careful with this one (and remember that you can always buy flameless candles, if you want the glow and not the fire hazard). Some good places to shop include TJ Maxx, Target, Walmart, and Amazon. Like the candles, a little bit of fire can spark a romantic evening with your partner, especially if it’s chilly outside. Don’t have a fireplace in your home? Check out this video of a roaring fire, which you can play on your computer or, if you have an HDMI cable, on your TV screen. Whether you go out on the town or stay in, giving your sweetheart a tasty meal is a great way to show your love. If you’re up for cooking, check out these menu ideas and recipes from Epicurious, Martha Stewart, or Bon Appetit. If you plan on going out or getting takeout, try picking a place that’s special to both of you, or one that you don’t go to often. You may want to make reservations in advance, especially if you’re going out on a weekend night. If you’re good with your hands, you could try giving your main squeeze a relaxing massage. For massage tips, you may want to try watching some YouTube videos or reading some handy tips (no pun intended) in advance. Of course, if you don’t have time to prepare a perfect night, we’re ready to give you a hand. 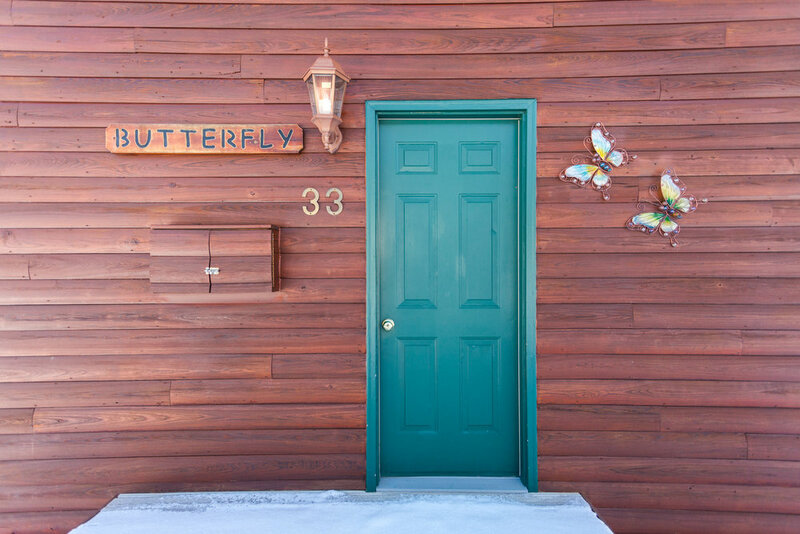 We offer all the romantic features mentioned above, including romantic music, which will greet you as you enter your cabin, a candlelit dinner set up by our staff, a roaring fireplace (not to mention heated floors), in-room massage therapy, and more. ● Plus other romantic surprises! 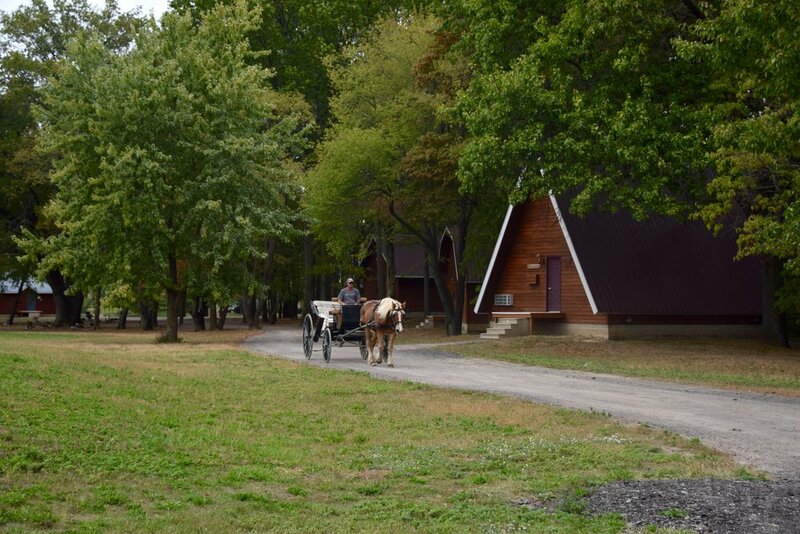 During your stay, you can also take advantage of our other standard offerings, including a horse-drawn carriage ride, individual fire pits, and a butler door, which allows you to communicate with our staff and receive special items easily, while still enjoying the privacy of your cabin. Letting us plan your romantic evening means that we can make sure that you and your partner both enjoy a stress-free night (or two!). Need more proof? Check out our Yelp ratings or Facebook page. So, if you’re full of love but running low on time, just give us a call. We’d love to help. To book your stay and one of our special packages, call us at (219) 861-0000 and mention promo code VDAYANYTIME.